Just downloaded latest Cyberduck for windows. 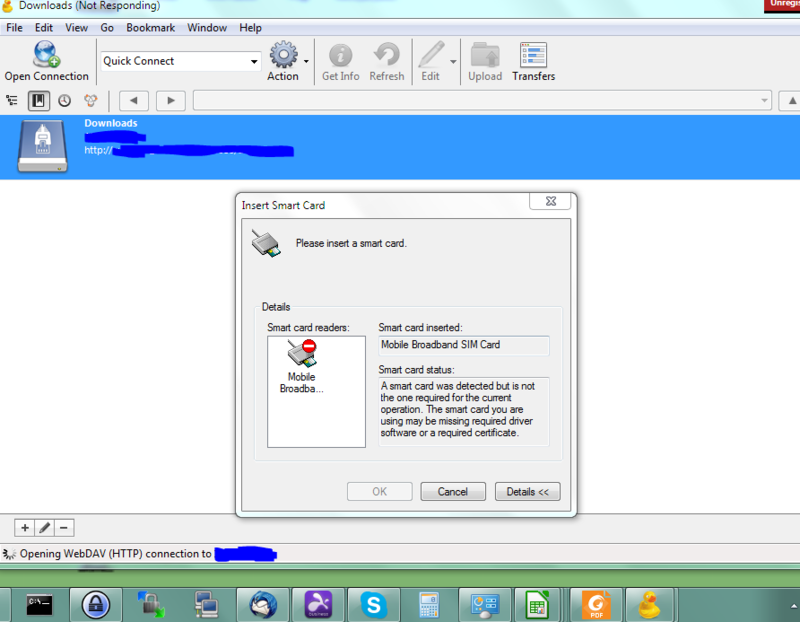 Launched and initiated a Webdav over http connection and it keeps pestering about inserting a smart card "Please insert a smart card" I can't click OK because my "smart card inserted" is Mobile Broadband SIM card aka 3G dongle and not the one required. After dismissing a few of those the connection gets established and I can transfer files but we are talking about 20 Cancel clicks here. cyberduck-smartcard.jpg​ (17.6 KB) - added by bertyhell on Aug 18, 2016 at 4:27:49 PM. It is a subwindow of Cyberduck. I would remotely understand a smart card dialog with SSL/TLS connections but HTTP? The Mobile Broadband card is turned off and I am using a wired connection. No VPN, no proxy. Does not happen when I mount the Webdav share with Explorer. It might be possible that we do a keystore initialization in any case. Need to check that. Anyhow, please remove all certificates from the Windows Certificate Store - Personal that are referencing the smart card you no longer have access to. Well I do have a real smart card reader (USB) and certificates that I require on a weekly basis. So you are saying that the workaround for me is to have the reader attached with a card every time I want to initiate a connection? Or get rid of the certificatites? It might be possible that we do a keystore initialization in any case. Need to check that. When i try to open a connection to amazon S3. I don't get the issue when connecting to any other servers. Is there any information i can give you to help debug this problem?